Less than one month till tour starts with Red Jumpsuit Apparatus! 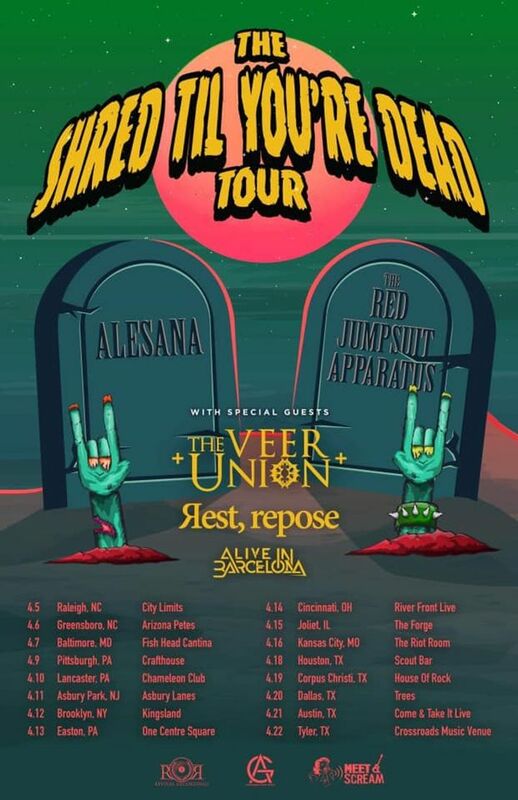 Which stop on the "Shred Till You're Dead" Tour will we see you at? VIP still available! Track to know when Alesana is playing near you. Alesana always puts up! They are amazing! Someone even felt compelled enough during our show to propose! Alesana even stopped playing to end a fight and said that their shows aren't about having that energy flow unto what energy they give and want reciprocated. Once the perpetrators were escorted out of the show they started from the top and the show went valiantly on! Can't wait to see Alesana next time! Alesana has yet to disappoint me in any sense. This was my second time seeing them perform live, and it was just as great as the first. The set list was excellent, the encore was perfect, and the after show meet and greet was a blast. I'm writing this off of alesana's performance. they really did have an amazing show! I absolutely loved how they did an encore even though they aren't paid overtime! haha. I honestly wish that they would come to Denver more often so that I have a chance to see a ton of their other songs live because I love every single one of their songs. I have yet to find a song that I hate by this band! they really know how to have a great high energy on the stage and their jokes are great! so please come to Denver to play some confessions! Alesana and all the opening bands killed it last night. So glad I could be there with all you guys. These guys will never lose their spark, they're so true to the early 2000's band they once were, almost completely original line up, and continue to put out albums and kick @$$! Absolutely amazing! Alesana never disappoints, and the opening bands were all fantastic, Newhaven, Navajo, and Be//gotten especially! I hope to see them all again in the future!